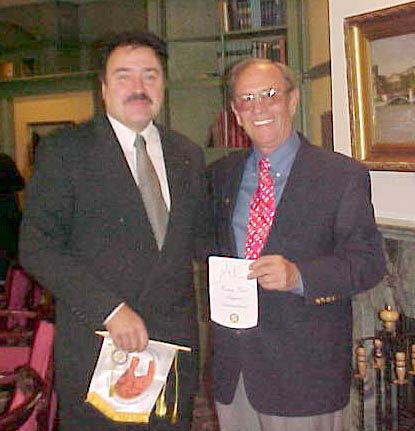 Following long established custom, Mike Lanham exchanged Rotary Club banners with President Willhelm of the Prague International Rotary Club on Friday, September 14, 2001. Mike is District Secretary, newsletter editor, directory publisher, and general factotum for Rotary District 5470, which encompasses the southern portion of Colorado and comprises 55 Rotary Clubs. In 2001 he was named “Rotarian of the Year” for District 5470. After devastating floods in the Czech Republic in 2002, the Prague International appealed to District 5470 for help, and was awarded $2,500 in disaster relief funds, thanks to the goodwill generated by Mike’s visit.